Who would you ask to do the best possible job of connecting disparate locations with an efficient transport system? Engineers? Try slime mold. In the picture shown below, researchers have carefully placed oat flakes in the pattern of Japanese cities around Tokyo. 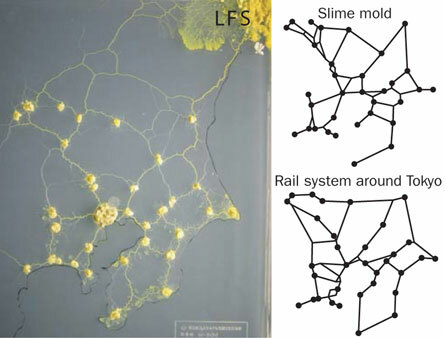 The slime mold Physarum polycephalum was introduced, eventually connecting the flakes with an efficient network to distribute nutrients throughout the single celled organism. Fricker is one of several researchers contributing a paper this month to Science on using the slime mold’s behavior to create a biology-inspired mathematical description of network formation. In their research, the slime-based model first creates a fine mesh network that goes everywhere. The mathematical model uses an ongoing process to refine the network so that the tubes carrying the most material grow more robust and redundant tubes are removed. It's not a prediction, but I'm reminded of the work of the clever intellectual cells in Greg Bear's wonderful 1984 novel Blood Music. In the story, they become more intelligent and, when introduced into the body of researcher Virgil Ulam, they restructure his body for greater efficiency, building networks that are actually visible across the surface of his skin. If I can find my copy of the book, I'll drop in an appropriate passage. Unfortunately, Blood Music is not one of those books that stays put on your shelf; friends want to borrow it, you read parts of it and put it down somewhere.... you get the picture. From (1) Rules for Biologically Inspired Adaptive Network Design via (2) Science News; thanks to an alert reader who passed on the tip about this great story.